This image is a small subset of the NASA GeoCover MrSID tile "43-40," meaning UTM Zone 43, between latitudes 40° N and 45° N. The resolution of GeoCover images is 30 meters/pixel. The picture was taken in the 1990's, and has been rotated it so that North is to the left. 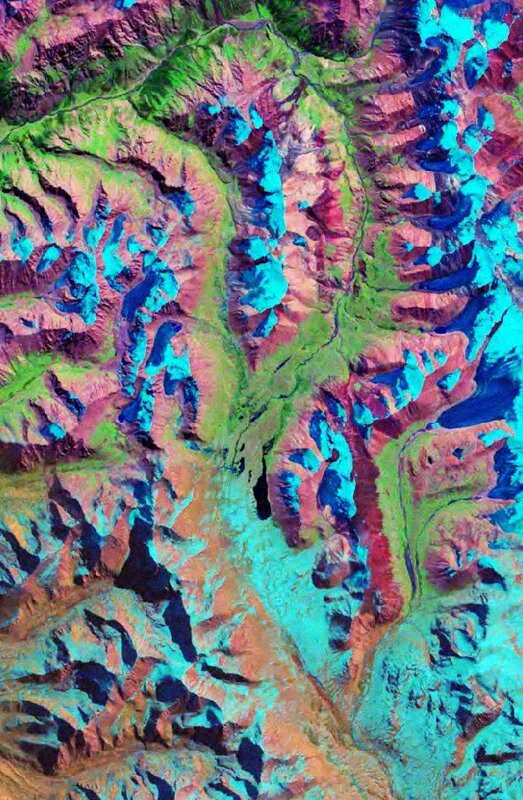 GeoCover is a short-wavelength infrared (SWIR) composite of Landsat 5 images. Landsat band 2 is displayed in blue, band 4 is displayed in green and band 7 (or 5) is displayed in red. For a nice explanation of Landsat images and bands, visit NASA's GeoCover tutorial.